Posted by flashlightblog in Author Signings, Book News, Pirates. Carrie Clickard, author of Victricia Malicia: Book-Loving Buccaneer, visited the Rose Marie Byron Center, an after-school program in Daytona, FL, on October 8, 2012. The little buccaneers made pirate crafts designed by Carrie (available on www.victriciamalicia.com), including pirate hats and paper parrots. 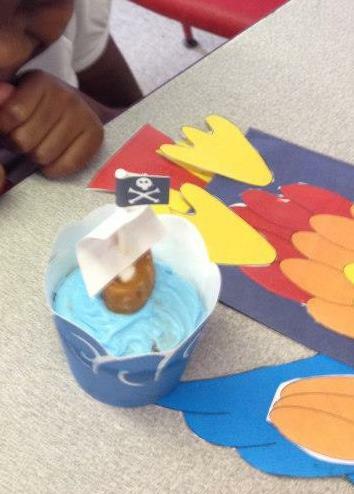 The students also indulged in some homemade pirate edibles. Posted by flashlightblog in Book News, Grandparents, Read Alouds. Laurie A. Jacobs, author of Silly Frilly Grandma Tillie, participated in the Project Sunshine Book Club on March 7 at a Manhattan hospital. Laurie channeled the silly playful spirit of Grandma Tillie and did an art project with the children. 25 copies of Silly Frilly Grandma Tillie were donated by Flashlight Press to the young patients. Project Sunshine is a nonprofit organization bringing programming – recreational, educational, and social service – to over 60,000 children facing medical challenges in 150 major cities across the United States and in five international satellite sites: Canada, China, Israel, Kenya and Puerto Rico. For more information, visit http://www.projectsunshine.org.